Road trips, the mother of all trips they say, the ultimate getaway. A road trip is all about the journey and not the destination; planning your route is important but staying flexible while you are on it is even more crucial.Of course you will want to set your starting point, days of travel, final destination and sites to visit along the way. Always leave room for the unexpected though.Roads constructions, accidents, hurricanes, flooding or last minute additions of sites you want to check out will affect your route and that’s part of a memorable road trip! Roadtrippers App will help you plot ahead your road trip route and allows you to edit it anytime. 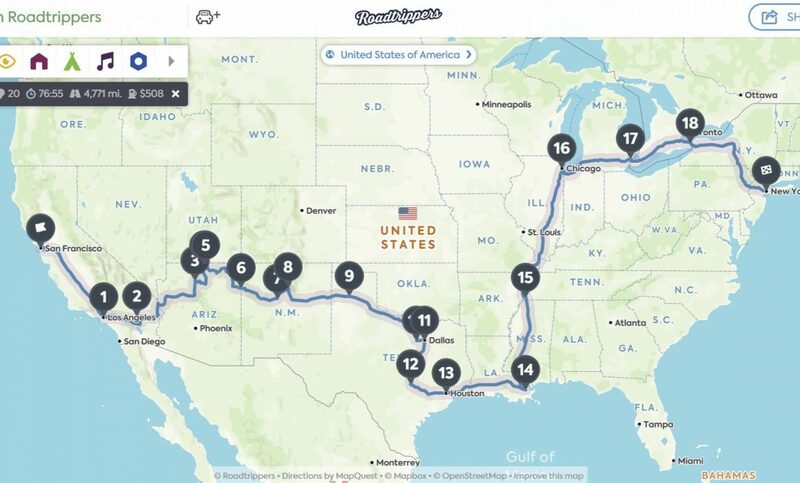 Insert your destination and dates of travel, what things you’re interested in finding along the way, where do you want to spend your night, and Roadtrippers will find vista points, restaurants, museums, camp sites, natural monuments, and much more for you. When you find a new site you like, add it to your trip, and see the updated route on the map.